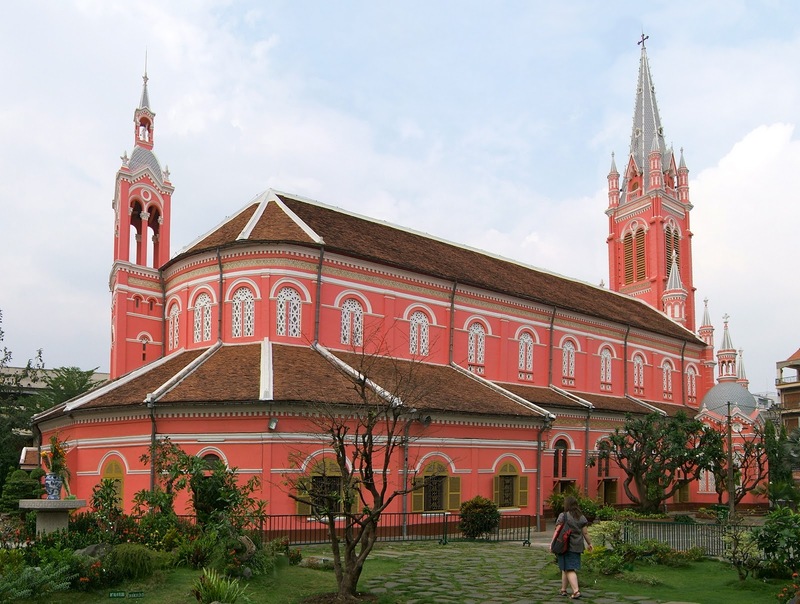 In my previous post I mentioned that we had visited the pink church on Hai Ba Trung. That's me in the foreground. Martin put together this composite shot. The real surprise of the visit was the peaceful little garden sanctuary at the back of the cathedral itself. It's not a large area but it features a full collection of beautiful statues depicting the scenes leading up to the crucifixion. After some research, I realised that the series of statues represents the traditional stations of the cross. You can find more about that here if you're interested. In the first station, Jesus is condemned to death. I thought this set was very placid and serene. Nobody looks too worried. At the second station, Jesus is given his cross. And he looks as though he is rejoicing! In the fouth station 'Jesus meets his mother'. so full of life and emotion. Sad and beautiful. This is Martin's favourite. In the fifth, Simon of Cyrene carries the cross. Is the roman guy helping Jesus here? 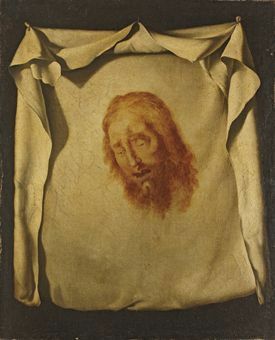 According to the story, Veronica gave her veil so that he could wipe his face, and when he returned it to her, his likeness was left on the cloth. This set shows Veronica offering her veil and the focus is still very much on Jesus and the cross. Many depictions of Veronica in art are closer to portraits of the face of Jesus as it appears on the cloth of the veil, with a serious Veronica holding the cloth up for all to see. In others, Veronica is completely absent, like this painting by Zurburan at around 1658. ... in preparation for the work that features on the back wall of the Chapelle du Rosaire de Vence which was built and decorated between 1949 and 1951 under a plan devised by him and regarded by Matisse himself as his masterpiece. with features is the face on Veronica's veil. In the seventh station, Jesus fell for a second time. And in the eighth station Jesus meets the daughters of Jerusalem. This is the third station to feature women. 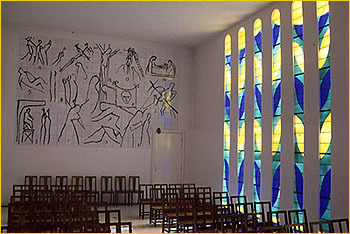 Jesus is stripped of his garments in the tenth station. The twelfth and thirteenth stations show Jesus dying on the cross, and his body being removed from the cross, before finally being laid in his tomb in the fourteenth station. 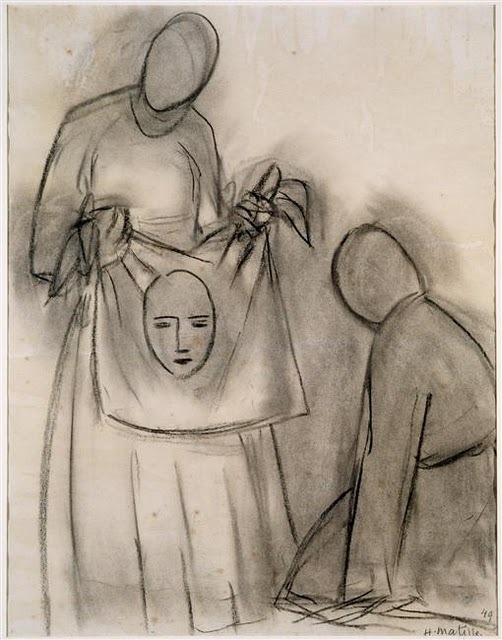 Mary is depicted also in each of these final three scenes. You can see throughout the pictures that the area where the statues are laid out is a very pretty garden with immaculate lawns and delicate flowers. The area is very small and it was difficult to get pictures without also getting the not so idyllic buildings in the background. But it is a very peaceful mid-city haven, and despite not being at all a religious person it is very easy for me to appreciate the quiet spirituality of this place. Following up on the art theme of this post, here is a more modern interpretation of the Stations of the Cross - the literal, classical storytelling in the sculptures above is challenged in these works by American artist Barnett Newman - who, to quote this Amazon.com article undertook "one of the most demanding assignments in the history of modern art, namely to thematize, without the use of color and only in black and white, the tragedy of human existence vis-à-vis an almighty God..."
Another really intersting story, will tell Mum to have a read.